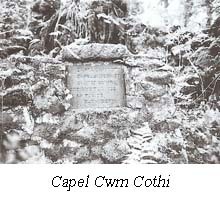 The first Unitarian Cause in Wales was established at Capel Cwm Cothi in a remote part of Carmarthenshire and led to the formation of the Welsh Unitarian Association in 1802. The Congregation at Cilau Aeron, Ceredigion was formed in 1650. It is not known when the first Chapel was constructed, but a new building was erected in 1900. The only other Congregation formed during the 17th century was at Caeronnen Chapel in Cellan, Ceredigion in 1654. 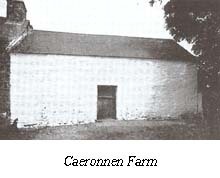 It is probable that the Congregation originally met in one of the outbuildings of Caeronnen Farm. The Congregation became Unitarian in the middle of the nineteenth century after the building of a Congregational Chapel in the village. 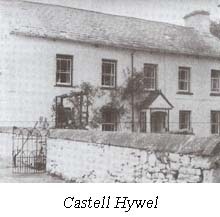 In 1716, Capel y Bryn at Cwrtnewydd, Ceredigion was founded. Initially the Congregation met at various farmhouses in the area, Crugmaen near Gorsgoch, Brynllefrith and Brynyreglwys. 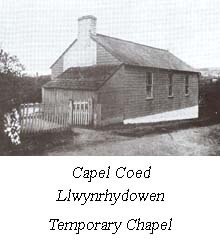 A Chapel, known as Capel Bryn Bach, was built in 1833 and was replaced by the present building in 1881. 1733 saw the building of a Chapel at Llwynrhydowen, Ceredigion. This building, with many alterations over time, was used until1868. In that year there was a General Election and the local landowner, who was the Tory Candidate, was displeased when many of the farmers voted for the Liberal Candidate. A temporary building was opened in 1876 with the present Chapel opening in 1879. Alltyblaca Chapel, Ceredigion, was established in 1740 as an Arminian cause. The Congregation passed through Arianism eventually becoming Unitarian. The present building dates from 1837 with a major restoration in 1892. Panteg Chapel, Capel Iwan, Carmarthenshire was built as a General Baptist Chapel in 1764. By 1816 it was being described as Unitarian Baptist. The Congregation lasted until the mid 1980s. 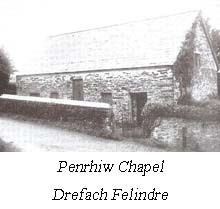 In 1777, Penrhiw Chapel was built near the village of Drefach Felindre, Carmarthenshire. After falling into disuse, the building was taken down, stone by stone, and rebuilt at the Museum of Welsh Life, St. Fagans, Cardiff. It is still occasionally used for Unitarian Services. 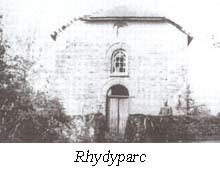 When the Glandwr Congregationalist Congregation split in 1788, Rhydyparc Chapel at Ffynnonlas, Carmarthenshire was formed. The Chapel was closed in 1880. Cribyn Chapel, Ceredigion, dates from 1790. The present building was erected in 1851. 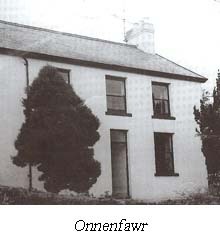 Onnenfawr, Near Trapp in Carmarthenshire was formed in the early 1800s and flourished in the early part of the century. There was much opposition to the Unitarian cause and the Chapel closed in 1886. The Chapel at Capel Y Groes, Llwynygroes, Ceredigion was built in 1802. 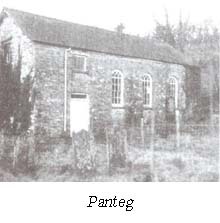 Pantydefaid Chapel near Llandysul, Ceredigion was established in 1802 and the present building dates from 1898. 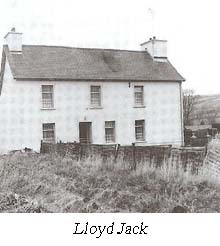 In 1802, a Congregation was founded at Lloyd Jack Farm, Vale of Aeron, Ceredigion and met in the outbuildings which can still be seen. The present Chapel was built in 1848. Capel y Fadfa, Bwlchyfadfa, Ceredigion was established in 1813. Built in 1827, Capel y Graig at St. Clears in Carmarthenshire closed in 1901. 1832 saw Cwmwrdu near Gwernogle in Carmarthenshire being built. Services ceased in the early 1900s but the building has, from 1961 until recently, been used as a centre for young Unitarians. The Unitarian cause in Llandysul, Ceredigion probably dates from the 1840s. The present building dates from 1884. 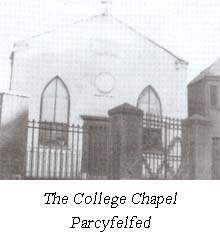 The College Chapel, Parcyfelfed in Carmarthen was built in 1849 and was in use until c.1991. From that date the Congregation held services at Tabernacle Chapel in the town. 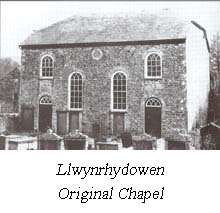 In 1876 the first Chapel was opened at Brondeifi in Lampeter, Ceredigion. The present building was erected in 1904. The little “outpost of Unitarianism” at Aberystwyth was founded in 1902, as the result of the missionary activities, in 1895, of Dr William Griffiths of Pontypridd and the Rev George St Clair of Aberdare. The congregation, as it gradually increased, moved to the New Market Hall. In 1904 the congregation decided to move to its final home, in New Street, a building which had been used for an estate office, a book-shop and a Quaker Meeting House. 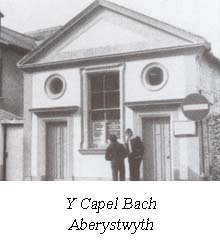 This building, known as Y Capel Bach, was formally dedicated to be used as a Unitarian church in 1906. It was purchased by the Unitarians in 1957 and sold in 2006. 1906 saw the building of Capel-y-Cwm, Cwmsychbant, Ceredigion. A small group of worshippers had previously been meeting in a store room above a shop in the village. A Congregation was established at Aberaeron in Ceredigion in 1968. 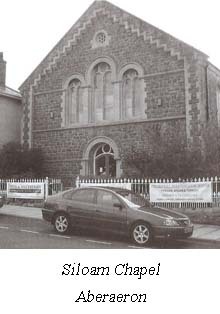 They met in Siloam, which was originally a Baptist Chapel. The Congregation died or moved on and the Cause was disbanded in 1976.